Tommy Kaulukukui Sr. pounds poi on his grandmother's pounding board. Tommy Kaulukukui gained national recognition as a University of Hawaii football player, but he is remembered by many locally for his positive influences in coaching and native Hawaiian issues. Kaulukukui, who had suffered from Alzheimer's disease, died yesterday at his sister's home in Kailua. He was 94. "My father's athletic accomplishments speak for themselves," said his son, Thomas Kaulukukui Jr. "He also led a life of service and tried to instill that in others. He was a very spiritual man and well balanced. I think he was most proud of his work as a teacher and coach, molding young people." Kaulukukui returned a kickoff 103 yards (still a UH record) in a game at UCLA in 1935 and was nicknamed "Grass Shack" by legendary sportswriter Grantland Rice. Kaulukukui also had a 39-yard touchdown run called back for holding in the game, which UCLA won 19-6. With Rice's support, Kaulukukui was named to the Board of Football All-American team. He was the first UH athlete to be named to any All-American squad. 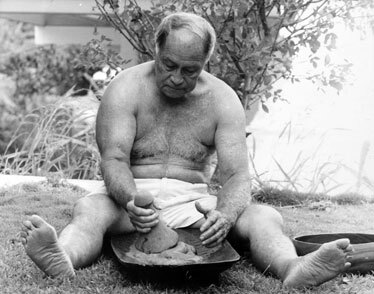 Kaulukukui was born in Kalihi in 1913. His family moved to the Big Island, and he graduated from Hilo High School in 1932. When he returned to Oahu to go to UH, he became the first in his family of 14 children to attend college. He earned 17 letters in five sports at UH and was named to the school's Circle of Honor in 1982. Kaulukukui is also a charter member of the Hawaii Sports Hall of Fame. He was student body president during his senior year. Following the bombing of Pearl Harbor in 1941, Kaulukukui served as an officer in a work battalion with young men of Japanese ancestry who were not allowed to volunteer for military duty. Many of these men later formed the nucleus of the famed 100th Battalion. He also served as a lieutenant in the U.S. Army Corps of Engineers during World War II. Kaulukukui became head football coach at UH, and his teams posted a record of 34-18-3 in 1941 and 1946-1950. He also served as athletic director. He owned an insurance agency in the 1950s, and received a presidential appointment in 1959 as U.S. marshall. 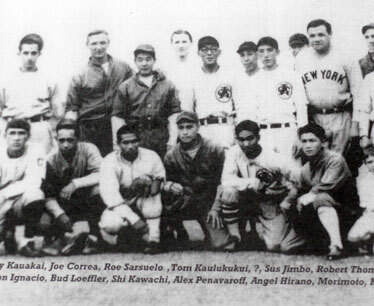 Thomas Kaulukukui Sr., fourth from left in front, gathers with other members of the Hilo All-Stars baseball team as they met Babe Ruth. In the 1960s, Kaulukukui was head football coach at Iolani. He was also the driving force in bringing Pop Warner youth football to Hawaii. While at Iolani, one of his assistant coaches was Eddie Hamada, who eventually became the head coach and another Hawaii sports legend. Hugh Yoshida -- future Leilehua coach, high school sports administrator and UH athletic director -- played fullback at Iolani when Kaulukukui was coach. "He was a brilliant offensive mind and the kind of person who coached you in a manner that made you want to work hard," Yoshida said. "He made the game fun, and at the same time you learned." At age 68, Kaulukukui successfully ran in the first Office of Hawaiian Affairs trustees election, and served for 12 years. Steve Kuna played football at UH when Kaulukukui was a volunteer assistant coach for the Rainbows, and he became an attorney who worked with Kaulukukui on OHA issues. "I was always in awe of him as a coach because he was so soft-spoken but commanded so much respect. I trusted everything he said. He told you your job and how to do it. None of that Vince Lombardi rah-rah stuff, but he gave you the confidence you needed," Kuna said. Kaulukukui was a calming force amid a chaotic OHA in its formative stages, Kuna said. "As a trustee, he was in the middle of what was a Wild West show, and the other trustees became polarized as it became defined as land issues versus revenue issues," Kuna said. "But Tommy followed his heart. He never aggravated someone on the other side of an issue, because everybody knew he did what he thought was right for the people. His decisions were never based on himself or special interests." Kaulukukui is survived by wife Felice; children Thomas Jr., Carol Malina and Donald; four grandchildren; six great-grandchildren; and brother Solomon. Sol Kaulukukui was also a star football player at UH, and played at Manoa when his brother was the coach. 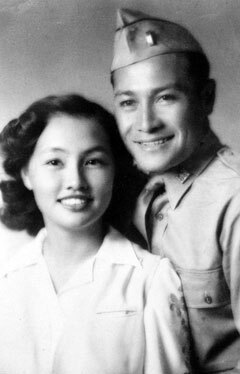 Kaulukukui is shown here with wife Felice in the early 1940s.